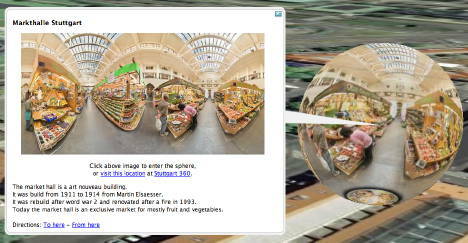 360Cities, one of a new crop of georeferenced city panorama photography sites (see also Arounder and ViewAt, reviewed here), is now using Google Earth 4.2’s ability to render embedded spheres using KML 2.2’s PhotoOverlay tag, writes 360Cities’ Jeffrey Martin. All 2,700 panoramas are being converted, but work has just started, so it will take a while. One city that is ready is Stuttgart. Check out its KML file. It’s time to hold Google to a higher standard. Their current implementation of viewing 360 imagery just doesn’t cut it for me. These bugs were addressed in the latest version of the beta.